All welcome! Click on the image opposite to download / view a PDF Flyer. FIT2FITE™ Fighting Moves To Funky Grooves is delighted to organise this fundraiser for Lauren, Chloe, Jordan, Danielle and Claire. These athletes reflect all the attributes that FIT2FITE works too develop and promote, discipline, dedication, determination , drive and humility. Their very presence at F2F classes provides a unique dynamic found in no other training environment; international athletes motivating and inspiring all around them. I, as a specialist Karate and fitness coach and advisor to these exceptional individuals, am both proud and privileged. 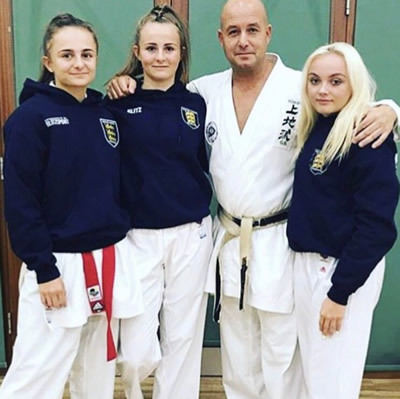 Good luck , Chloe, Lauren, Jordan and Danielle at the World Junior karate Championships in Tenerife and to Claire at the DFAC Natural Body Building Championships in Miami. Special thanks to the co-sponsors of this event. 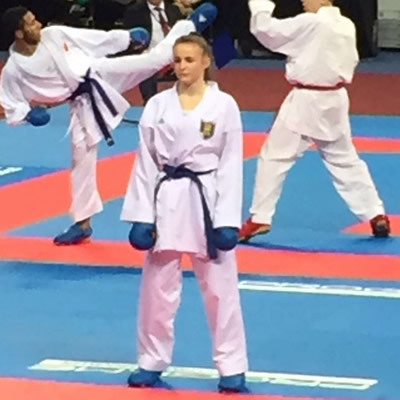 My name is Lauren Salisbury and I have been doing karate since the age of 5 and have been competing internationally for the last 4 years . I manage to train every night of the week whilst also studying GCSE's at the Albany School, where I am currently head girl. I have also been awarded a Jack Petchy award for my commitment to sport and contribution to school teams. I have high ambitions for myself and aiming for an Olympics either Tokyo 2020 or 2024. I have recently been selected to represent my country at the u21 world championships in Tenerife in October. I'm going out there with the intention of medaling and I am training 2 times every day to achieve this. 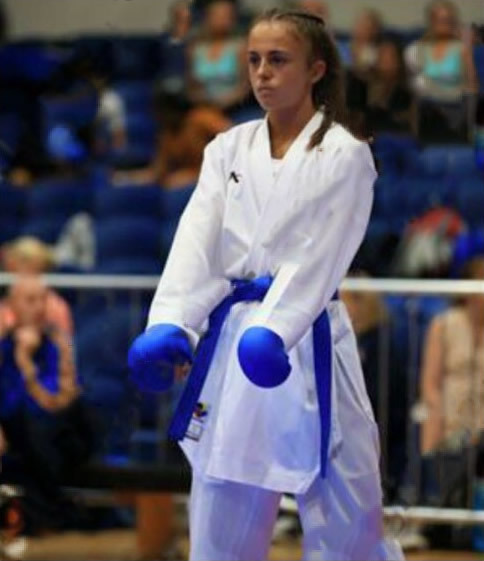 My name is Chloe Salisbury and I have been doing karate since the age of 7 and have been competing internationally for the last 4 years . I manage to train every night of the week whilst also studying alevels at the best state sports school in the country ( the coopers company and coborn school) . Last year during my gcses I dropped one training session and still worked towards the grades I was aiming for and walked away with 2 A* 6A and 5B 's. I have high ambitions for myself and aiming for an olympics either Tokyo 2020 or 2024 , I have recently been selected to represent my country at the u21 world championships in Tenerife in October , I'm going out there with the intention of medaling and I am training 2 times every day to achieve this . After finishing 7th in the most recent European Championships, my WKF World ranking was 9th, (My category was Junior 16-17 years). I have also represented the National regional Midlands Karate Team on 6 occasions, since 2012. 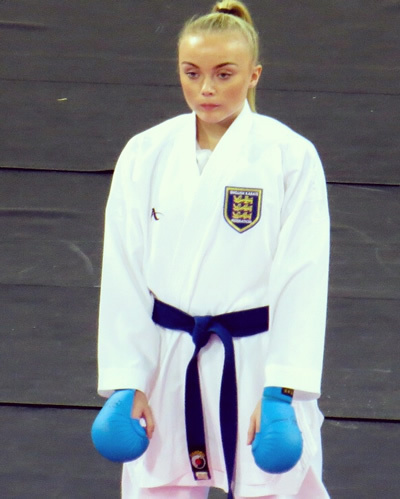 I also represent my karate club, Uechi-Ryu (GB), under coach, Dean Lowe, (former 9 x World Champion), Dr Wayne Otto OBE, and Uechi-Ryu head-coach Terry Daly (Former World and European medallist). I fight in both domestic and International open competitions for my club. In 2017 our club has a newly formed association with a French karate association (Planoise Karate Academy), for which I have been granted a FFK licence to compete in the three major domestic French karate competitions. I started competition karate relatively late in life at 12 years old. 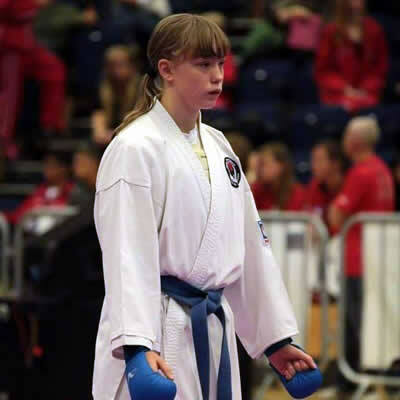 It stemmed from an all round sporting ability, that saw me represent my school at various National athletics and cross-country finals over the years, but karate became my number one sporting passion. I have achieved my initial goals to be English and British Champion and to represent my Country at major internationals. But the journey has only just started. I felt injury cost me a medal at the 2016 European Championships and this remains a realistic goal for me to set to achieve again hopefully in Tenerife at the World Championships at the end of October 2017. Alongside this I am a full time student achieving seven GCSEs A*- B grade, three a levels (Law, PE and English combined) and now I have a place at the University of Essex to study a Law degree. I have also applied for a sports scholarship for karate at the university to help fund my training and trips. The girls are a credit to themselves, their parents and Karate. Whatever is asked of them they do, no questions or excuses. They have a maturity well beyond their ages. Chloe, Lauren and Jordan have a passion and focus to achieve in karate that reflects their application to their studies. Their training programme is crazy, training everyday either karate, fitness or gym work incorporating FIT2FITE and Karate with Sensei Greg Francis. FIT2FITE has enhanced their stamina, agility, timing and technique plus the training environment is martial which drives them on to work harder. I thank everyone that are in the classes with the girls you have all had a input into their journey journey. Just finished A levels at Billericay school- now studying sport and exercises science at the University of Kent. Also a sports scholar for Kent County. Train 6 - 10 times a week depending on Competition Calender. Quite often twice a day . Training consists of fitness (FIT2FITE), Competion drils, sparrin, focus pads and gym work with cardio and now starting to incorporate weights and Swimming pool drills..
First and foremost my aim is to get a place on the senior national team and retain my place on the junior one. Domestically I aim to get a national senior title and internationally I aim to one day medal at a major championships. All this to build up to the ultimate goal which is to one day be able to qualify for the Olympics in the future once I have found my feet as a snr.Achievements. Claire has over 18 years experience in the fitness industry from International Presenter to her current full time role as PT Sales Manager at the prestigious Third Space Sports Club, Canary Wharf. Discovering Bodybuilding at the tender age of 42, Claire has achieved Pro Status as a Figure Athlete and has represented the BNBF (British Natural Bodybuilding Federation) GB Team at two DFAC World Finals in Miami. On 4th November 2017, Claire will compete for a third time!